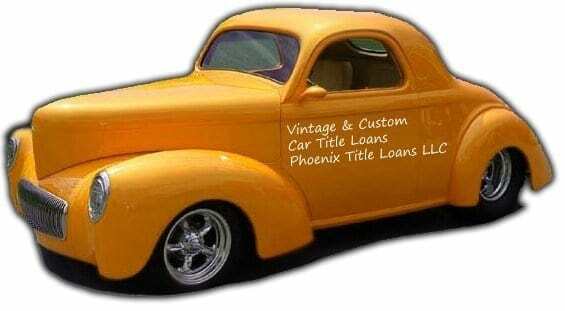 Phoenix Title Loans, LLC is the place to come for all auto title loans, but we’re especially unique for the fact that we will even offer title loans on custom vehicles, and even vintage vehicles. These cars are truly unique, and we understand that, and are here to offer you the money you need regardless of what it’s for. We have 10 valley-wide locations in Phoenix Metro, Scottsdale, Avondale, Mesa, Tempe, Chandler and Casa Grande where you can receive a vintage car title loan. Unlike most banks and other lenders, Phoenix Title Loans, LLC is able to use old, unique or collectible cars as collateral for a loan. We’ll take your Ferrari, Lamborghini, Corvette, T-Bucket or other extremely unique vehicle allowing you to utilize the title of that car you already own to secure the cash you need. Just as long as you have a clear title in your name then you may be already qualified for a Collectible, Custom, or Vintage Title Loan. Need a Collectible Car Loan? A Collectible Car Loan from Phoenix Title Loans, LLC allows you to get a large amount of money fast, with no points and minimal filing fees. At our ten locations, you can get up to 36 months to repay your Collectible Car Loan with absolutely no penalties or fees applied should you pay your loan off early. We even offer you the option of storing your vehicle for you in our secured and safe garage or we can leave the vehicle with you allowing your continued enjoyment of driving and showing your vehicle. We have 10 valley-wide locations in Phoenix Metro, Scottsdale, Avondale, Mesa, Tempe, Chandler and Casa Grande to help you with your cash needs. As the upstanding title loan lender in the Valley of the Sun for over a decade, we’re experts on all title loans, even particularly unique ones such as Collectible Car Title Loans. If you’re holding onto such a valuable vehicle and need a title loan, you need to find a lender that not only you can trust, but one that will give you a fair valuation of your vehicle while also maintaining appropriate interest rates, loan terms, and payment plans. Deal with a professional and leave the amateurs in the dust. Get the money you need within an hour with a Collectible/Vintage Car Loan from Phoenix Title Loans, LLC by completing our online application, give us a call or visit one of our 10 valley-wide locations. If you need cash now then don’t delay. Let us provide you with a Collectible Car Loan to get you the money you need today. Proudly servicing Phoenix Metro, Scottsdale, Avondale, Mesa, Tempe, Chandler and Casa Grande.